Yesterday we grabbed a rental car and burned some fossil fuel running up to Colonial Williamsburg, which the crew has long yearned to visit. If you're not familiar with the place, it's a living history museum that lets you step back into the 1700s. The houses, the shops, and the public buildings--armory, courthouse, jail, several churches--have been restored or reconstructed using "historically correct materials." (I DID notice, however, that the antique iron street lamps use compact fluorescent bulbs). Let me tune up my howl." We're safely docked in Portsmouth, VA, and we feel right at home--this city has electric buses! Over the next two weeks, we'll be working our way north up the Chesapeake, with stops in Hampton, Annapolis, St. Michael's and other ports. Looking forward to greeting visitors. 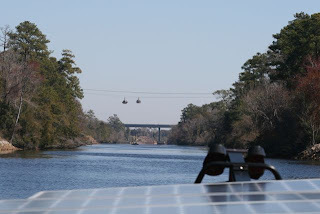 Our final miles on the Great Dismal Swamp Canal were also our final miles on the Atlantic Intracoastal Waterway. The trip wrapped up with a literal blast: At the canal's Deep Creek Lock, we met the self-described "world's best conch player," Robert Peek (see photo at left). Some background here: Back in the 1800s, before airhorns or VHF radios were invented, canal boaters and locktenders used conch shells to communicate with one another. By blowing into a hole at the tip of the shell, you can make a sound as loud--and as musical--as any trumpet. Is that the smoke from burning sox? 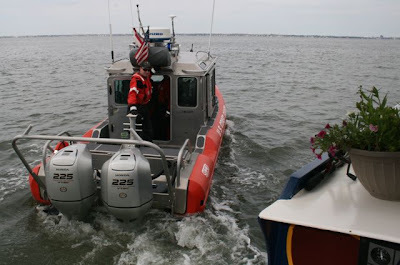 Today we learned that sailors on Chesapeake Bay celebrate March 21--the spring equinox--by burning their socks. "Should we burn our socks to celebrate our safe arrival?" asked the crew. "No!" said Cap. "I need all the sox I've got to keep my feet warm!" With a forecast of "High 40, feels like 35," and feeling colder, we pulled away from the Not Very Dismal Swamp Visitors Center dock. A nice little stinging wet mist was blowing, for added traveling pleasure. But we were well fortified for the day's travails. Yesterday, after a sunny cruise on canal (photos HERE), we docked to enjoy a fried-chicken-dinner at the Great Dismal Swamp Welcome Center. 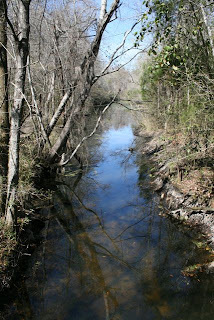 Today we travelled from Elizabeth City along the Pasquatank River till it became the Great Dismal Swamp Canal. We've been looking forward to this leg of the trip for a while. Heck, just saying the name is fun. 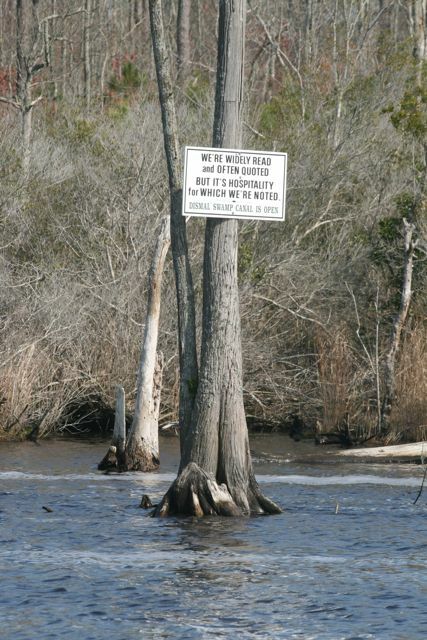 Try it: "Great Dismal Swamp." There, don't you feel better as you contemplate those piles of snow? 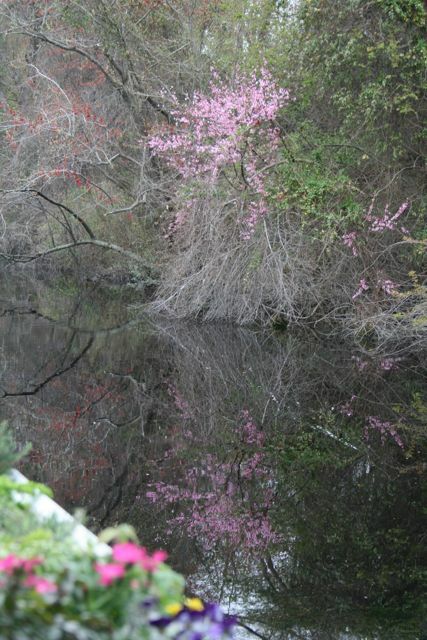 The Great Dismal Swamp Canal predates the Erie Canal (SlowBoat's home) by a good bit. George Washington, a well-known promoter of canals, was strongly in favor of this one, which gave merchant boats a shortcut from North Carolina's (dreaded) Albemarle Sound up to Norfolk and ports on the Chesapeake. Construction started in 1793. Much of the work was done by slaves, released from their plantation jobs in the off season. The first boat to float a portion of the canal, in 1805, was a "shingle flat" (which sounds exotic but is simply a flat-bottomed barge loaded with roofing shingles--a popular export product of the region, made from rot-resistant native cypress trees). The 22-mile-long canal (far shorter than the Erie) was completed in 1814, after the British coastal blockade during the War of 1812 made the gummint sit up and take notice how handy the shortcut would be. From Oriental we had travelled Monday to Belhaven, where we stayed at a family-owned marina with lots of charming touches: A gazebo on the point, furnished with wicker chairs and brass ship's lamps, perfect for sunset gazing. Whitewashed rocking chairs for a comfortable wait outside the laundry room. And quite possibly the world's best marina bathroom. From Oriental we pressed seaward on the wide Neuse River, then north up a narrow channel past the shrimp dock at Hobucken. 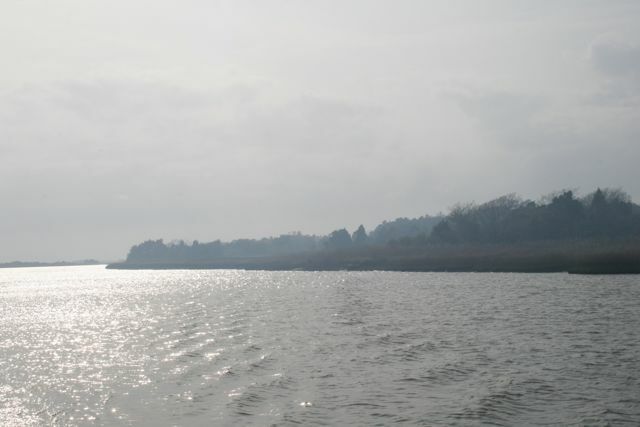 Then, with brisk winds and a following sea, we made a run across the Pamlico River to the tiny town of Belhaven . . . a welcome haven indeed after a day of jolting on the bounding main. 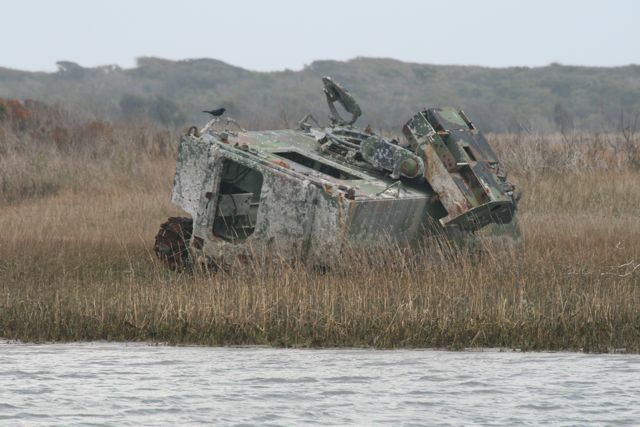 Back around Wrightsville Beach, we spotted an odd vessel--a boat with a conveyor belt bolted to one side. As the boat meandered just outside the channel, the conveyor belt rumbled, dropping what looked like large chunks of gravel into the water. What the heck?! After some research, I finally figured out what that boat was doing. It was a shellfish relay. I know. The term suggests images of elementary school kids in track shoes, running back and forth with jumbo shrimp as batons. 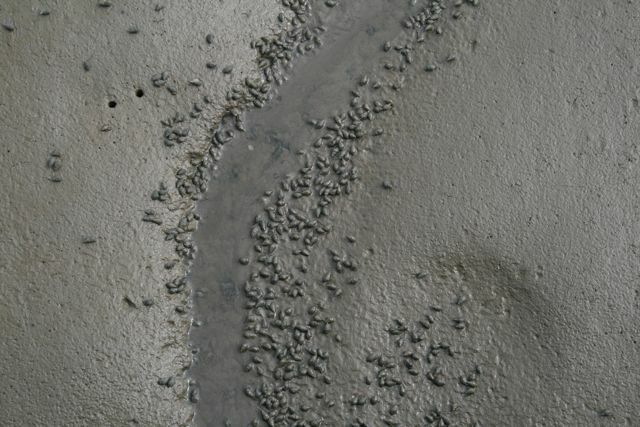 But actually, a shellfish relay is one way states manage their oyster and clam harvests. 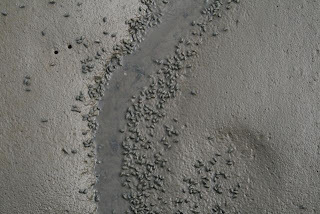 As far as I understand it, fisheries managers move oysters around for a couple of reasons. First, Mom wants to know where we are. 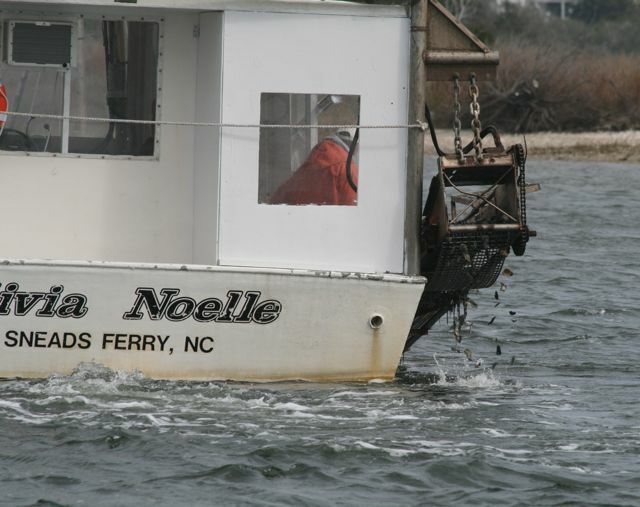 We are in Oriental, North Carolina, where the harborcam is trained right on our pretty little hull. Check it OUT! In other news (if you are not totally tired of reading these things), SlowBoat is the featured story today in a Spanish on-line energy magazine. We spent last night tied to a restaurant dock in Morehead City, which is near Beaufort but with more fisherman and fewer condos. While Cap teleconferenced, the crew paddled the dink ashore for a commando raid on local antique stores. 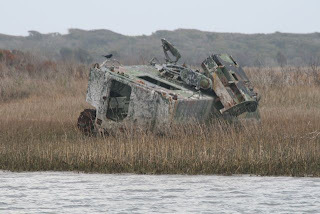 Her commando skills were in fine tune, since Cap and Crew had just successfully navigated the tank-strewn, bullet-riddled, helicopter-policed shores of Camp LeJeune. They're NOT here to borrow a cup of Grey Poupon. Our route yesterday took us almost to the border of Camp LeJeune, the North Carolina military installation. All day, big helicopters buzzed over us like angry wasps. Chatter on the radio warned recreational vessels to avoid a certain offshore region because of live fire exercises. 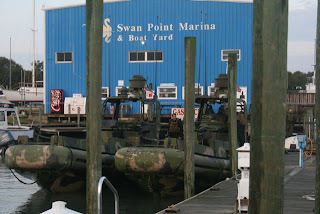 We docked at a little marina favored by shrimp and crab boats. Parted the curtains this morning to see four camouflage Zodiacs pulling up on the opposite side of our dock, all manned by helmeted marines wearing sidearms. Good thing Cap's been practicing his amphibious-assault maneuvers! Items in the little local paper, the Topsail Advertiser, reflect the local military influence. A "Women's Expo" held last weekend at the Surf City community center (admission $3) offered local residents this list of attractions: Bodywear, Embroidery, Massage, Travel, Shoes, Home Improvement, Guns and Ammo. New amusing photos on the amusing photo page . . .
Sunday. All day, we cruised past Myrtle Beach housing developments. We were looking forward to our planned anchorage, at Calabash Creek. "Peaceful . . . scenic view of marshes . . . " said the guidebook. "Short dinghy ride to great seafood restaurants." 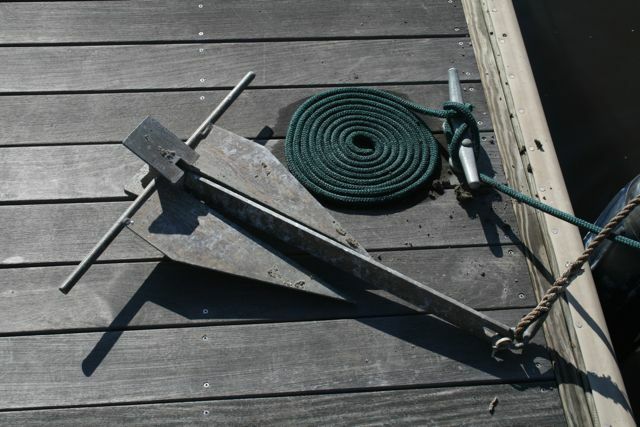 The site called for two anchors: The honkin' big plow anchor, off the bow, and our petite Danforth, off the stern. Cap heaved the Danforth over, we ran the boat forward to set the anchor, the current tugged us backwards, and almost too quick for thought the anchor line wrapped around the prop. There we were. Up a creek. Dead in the water. Less than an hour of daylight. 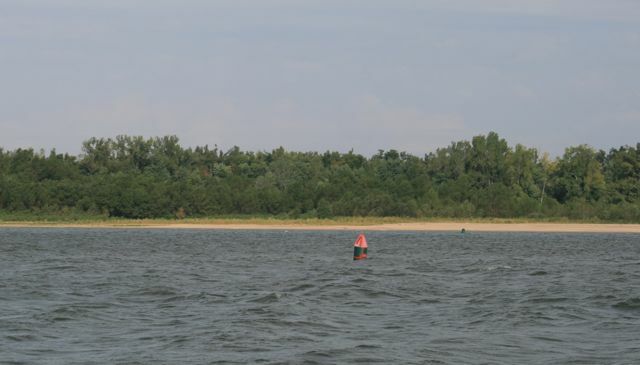 We're anchored near Little River, South Carolina--about 30 miles south of Cape Fear. 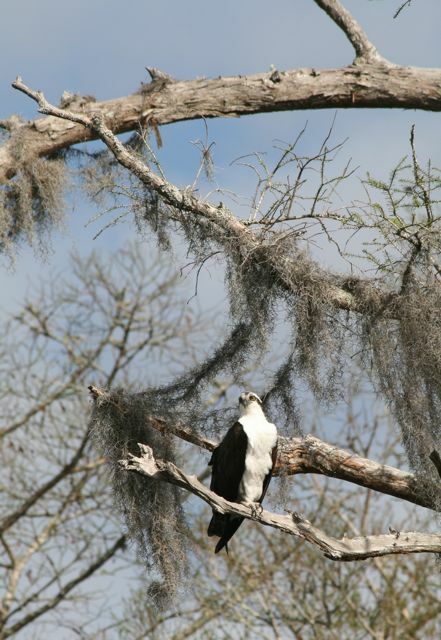 We cruised along today in the sunlight, with the electric motor humming quietly; about every 100 yards we'd spot an osprey on a nest. 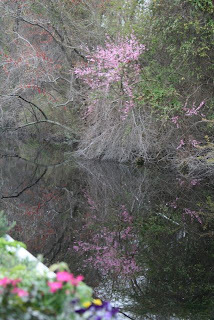 The bald cypress trees seemed to visibly push out their feathery green leaves as we watched. Hopeful signs of spring are good. It all seemed surreal. The news from Japan is terrible. If you're here on this page because you're taking a quick brief break from bad news, here's some brain candy. 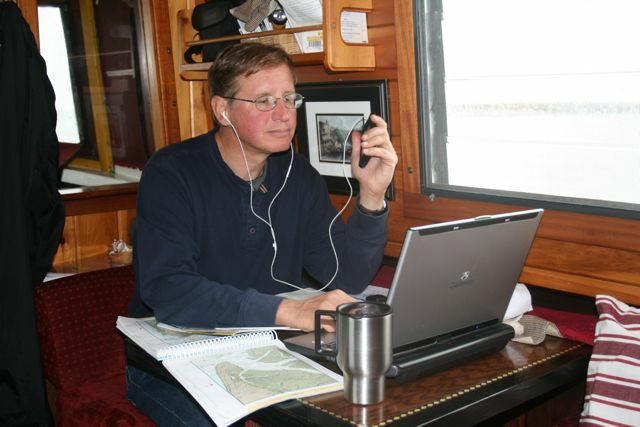 Click to the next page to preview an article that's about to appear in the April 2011 issue of Latitudes and Attitudes, a slightly offbeat magazine for sailboat enthusiasts. We met the author, Craig Ligibel, during our stay on Useppa Island in Florida. Tomorrow I'll tell you all about our FURTHER adventures in anchoring, and scooting under low bridges, and meeting (I am not making this up) Captain Kirk. 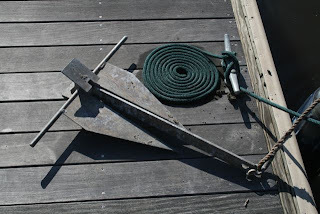 We had limited experience with anchors before we set out on this trip. OK, the rowboat at the family camp, up on the lake, had an anchor--specifically, a rock, tied to a rope. 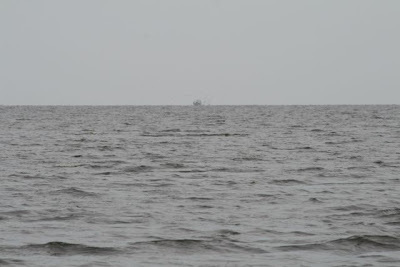 You lowered it over the side, in shallow water, to keep the boat still, so you could fish. A rock-on-a-rope is a simple system. 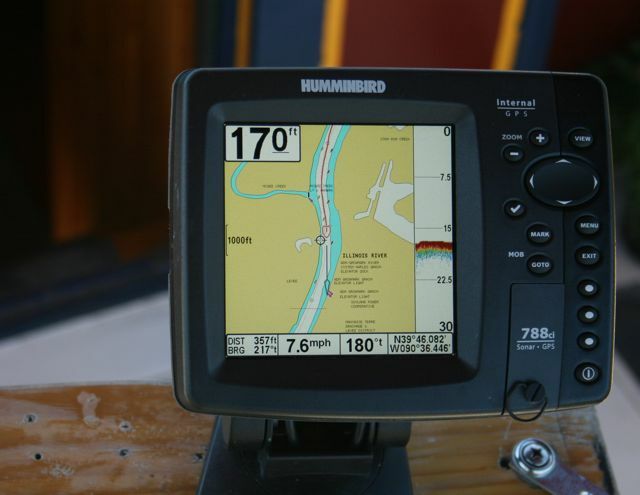 You won’t find any “how-to” books, or boating websites, or weekend classes that teach you how to use it. Granted, a rock anchor is useless in a gale. 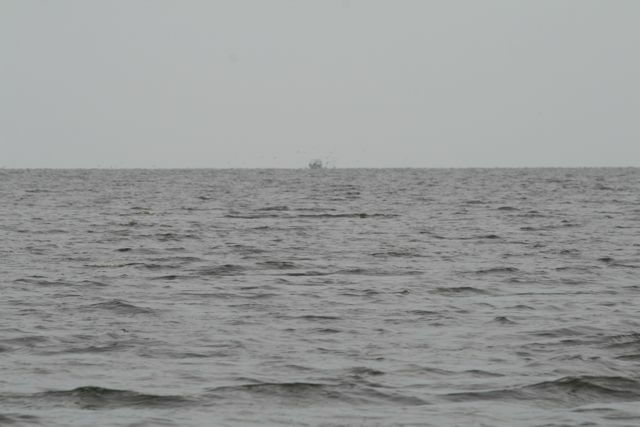 But you probably don’t want to fish from a rowboat in a gale. 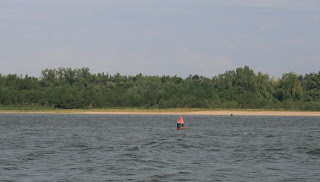 Then we anchored Wednesday night in Minim Creek, a narrow tidal river. To find out what happened, keep reading, below. Click here for a different adventure in anchoring. this copter would fit perfectly on the deck of SlowBoat." We're still in Charleston. The new flex coupler has been installed and the propellor turns without a wobble! Thanks, Mid-Lakes! Cap still needs to re-install the electric motor. 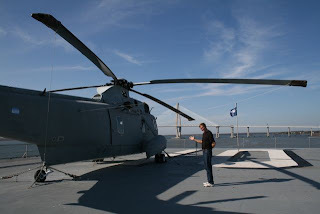 But we dragged him out of the engine room long enough to tour the aircraft carrier Yorktown. The experience just made Cap hideously jealous, since the Yorktown (which, like us, is a large, steel-hulled vessel) has its very own helicopter. 1. We send monthly trip reports to our hometown paper, the Centre Daily Times. Read the latest installment HERE. 2. 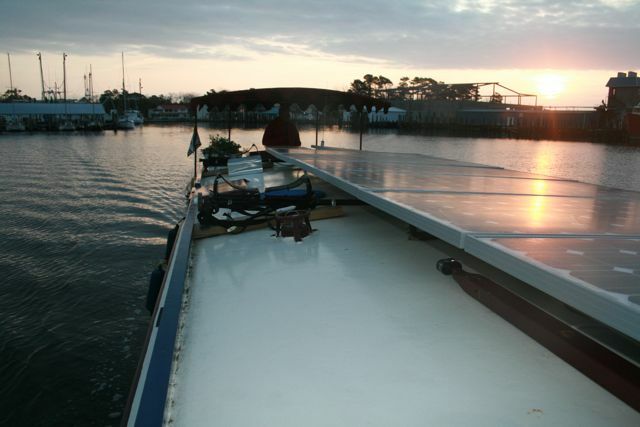 The voyage of the Dragonfly was recently featured on the website "SolarChargedDriving." 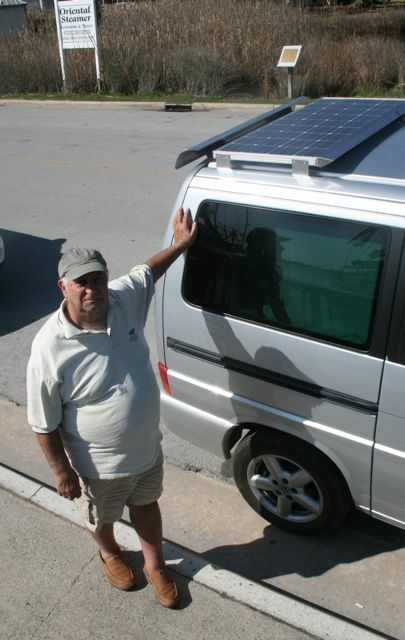 As the name suggests, the site is all about vehicles that run on the sun. If you're a regular visitor to this page, you know Dragonfly is a canal boat, and her home port is the Erie Canal. We've gotten quite interested in canals. In fact, one of our mottos (right after "High Five! We didn't sink the boat today!") is: "We never miss a canal." We're still in Charleston, and Wednesday we took a little side trip (by rental car) about 30 miles north of the city, to see a canal that's EVEN OLDER than the Erie Canal. It's called the Santee Canal, and though it no longer operates, a segment of the original "ditch" is protected in a charming park. We roamed the overgrown banks in the sunshine, imagining canal boats laden with cotton slipping past the alligators and spotted turtles. (Check out more PHOTOS HERE). Historians call the Santee "America's first summit canal." Oh, those historians. There's always a qualifier. 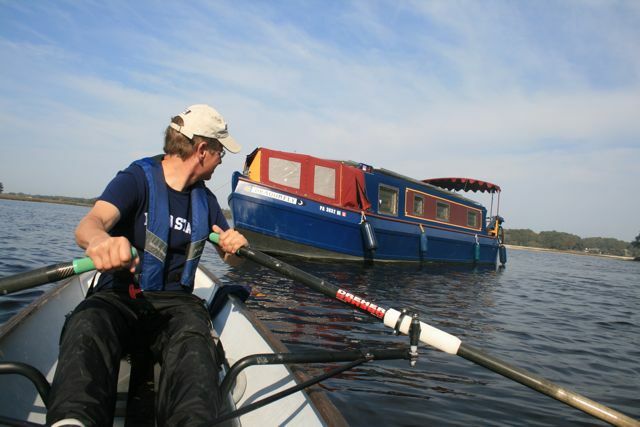 Some canals merely take your boat on a detour around rapids or a dam. A true "summit canal" connects two rivers . . . which by definition are in different watersheds . 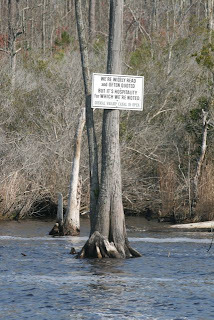 . . which means the canal must take you up and over the "summit" that separates the watersheds. (The actual summit may consist of quite a small change in elevation). The route for the Santee Canal was surveyed in 1773, before America was officially a nation! No less a personage than George Washington was a fan, saying, "it gives me great pleasure to find a spirit of inland navigation prevailing so generously." On Wednesday, the crew pried the Cap'n free from the engine room to explore Charleston a bit. 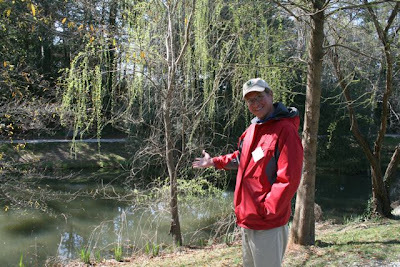 Our visit to a green shopping center, back in Savannah, made us want to know more about green building technologies. 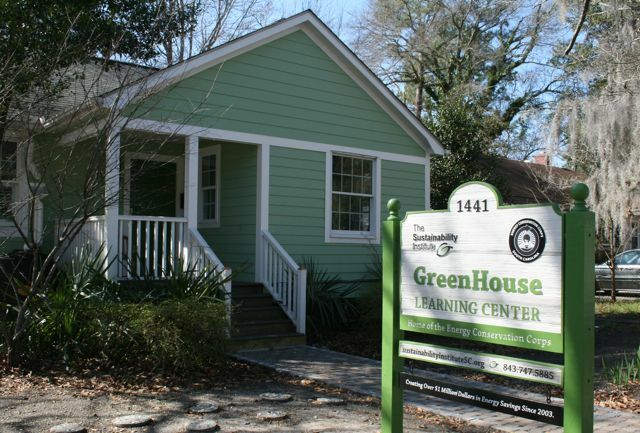 So we arranged for a tour of the "Green House Learning Center," a facility run by Charleston's Sustainability Institute. The Green House IS a house. It's painted pale green. And at first glance it looks quite unexceptional--just one more little box in a neighborhood full of similar modest one-story houses. Then Jay Bell starts pointing out the features. Rain barrels that collect water to flush the toilet. Spray-foam insulation in the roof that reduces air conditioning costs in the hot summer months. Energy-efficient LED lights throughout. 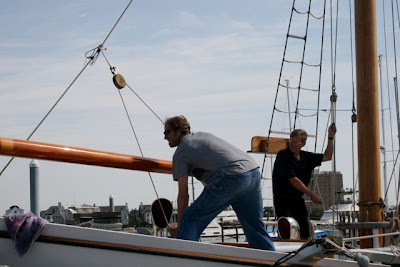 to us install their bowsprit. MORE PHOTOS HERE! We're in Charleston, South Carolina this week, working on the engine . . . and taking your questions about SlowBoatCruising. (Meanwhile, YOU can take our new poll, at right). "What have been your top five places so far, and why?" Whew. Do we have to pick a mere five? Piloting the boat through downtown Chicago in the early morning sunlight, goggling at the skyscrapers and waving to the commuters. Sure, you can make the same trip on a tour boat. But doing it on our own seemed particularly magical. The Academy Awards blew by us this year. We don't have TV on the boat, so we didn't watch the ceremony. And having seen exactly one movie this year, we didn't know much about the nominees. Okay, we'd sort of seen one movie. We tried to watch "True Grit" in Clewiston, Florida. But the sweet little old-fashioned art-house theatre had the reels out of order. We would have enjoying seeing movies on some of our stops in port. But the sad truth is, most towns no longer have a movie theater downtown (i.e., walking distance from a dock). And we didn't want to shell out the bucks to rent a car or take a taxi to get to the exurbs, just to watch a movie at a Google-plex.